Keep The Force with you wherever you go. There’s nothing crummier than an uncharged lightsaber. Just ask Luke and Leia’s cousin, Fritz. You don’t hear about Fritz much. His lightsaber duel with the bad guys ended pretty quick when he realized he hadn’t charged his weapon. Poor Fritz. Never made it onto the big screen. Don’t end up like Fritz. 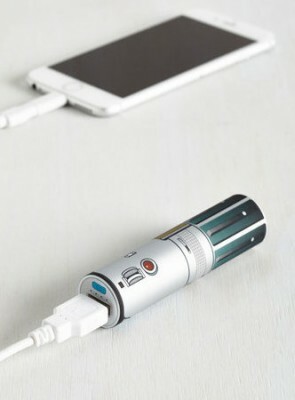 Make sure your devices are charged ALL the time, with this Lightsaber Portable Charger. And check out our other Favorite Star Wars Gift Guide while you’re here. It’s filled with Galactic Goodness! That is absolutely adorable, my daughter is now begging me for this.